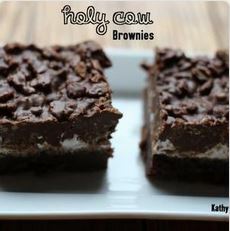 As good as plain brownies are, these Holy Cow Brownies are an incredible way to make brownies decadent and fun! The bottom brownie layer is thick and fudge-y. The middle layer is marshmallow fluff and the top layer is chocolate, peanut butter and rice cereal. Preheat the oven to 350 degrees. Prepare a 9×13 baking dish by spraying it with cooking spray or lining with aluminum foil and set aside. In a saucepan, add the chocolate chips and butter. Stir until melted. Remove from heat and add the sugar and vanilla. Stir well. Add each egg one at a time, fully incorporating each egg until adding another one. Pour the brownie batter into the prepared baking dish. Bake for 25-30 minutes, being careful not to over bake. Near the end of the cooking time for the brownies, prepare the topping. In a saucepan, melt the chocolate chips and peanut butter. Stirring often over low heat. When fully melted, remove from heat and stir in the rice cereal. when the brownies are done, spread the marshmallow creme over the warm brownies. Then, carefully pour the rice cereal mixture over the marshmallow creme. Let cool and then chill in the refrigerator for a couple of hours until cool. store in the refrigerator.